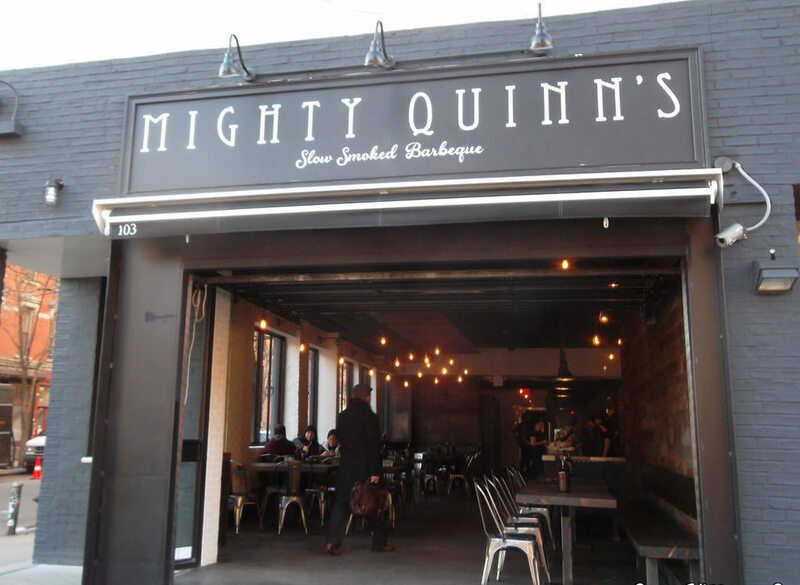 The New York State of Mind- Mighty Quinn’s BBQ – Food. Boom. 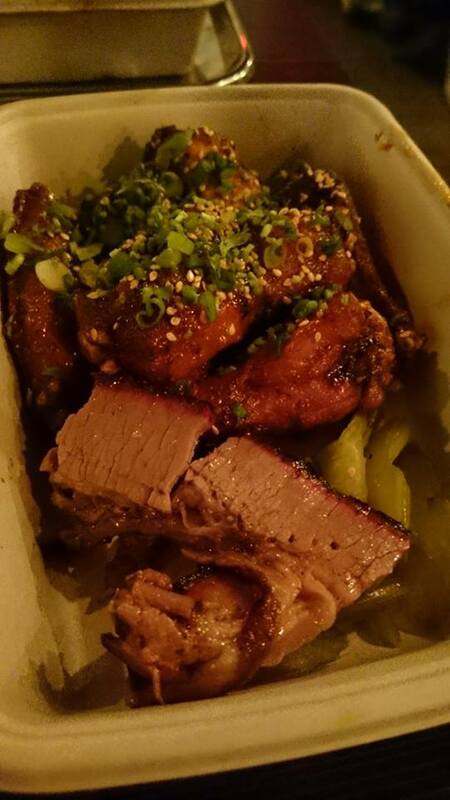 What: Modern BBQ- ribs, brisket, wings, burnt ends. Mighty Quinn’s was an early hit on my search list for where to eat in the East Village, convenient to our digs but I have to say it still would have been well worth the trip from further across town. I’ve gone on previously about the BBQ trend in the UK at the moment and how easily and frequently wrong it goes. People trying to run a city based BBQ trend eatery need to go to Mighty Quinn’s, because this is how you do it. The typical traits of such places are all there- no reservations, no table service, clunky furniture designed to look like there has been little care it its design, you know the type. But in a new twist you can’t even take a seat in MQ’s until you’ve got your dinner, as we were told in slightly tired terms by a nice chap who was cleaning but certainly not serving the tables. We later exchanged brief words about the upcoming Justice League movie and possibilities of Ben Affleck totally cocking up Batman. Extra points for friendly (if Affleck deluded) staff too. So you don’t sit down, which is potentially irritating but not the end of the world. Instead you join the queue at one end of the wooden floorboarded space and shuffle expectantly up to the grills to see the staff at their craft up close and personal, all the while drowning in a meaty dream haze of sizzling smells that suddenly render it impossible to select your choice of dinner from a relatively short menu. You get a few meat choices (which you can buy per person or just by the pound), naked or in bread, then a few more sides and sort of salads. I had thankfully already decided before going that I wanted burnt ends. Which they had sold out of by 9 on a Thursday. Boo. Wings n brisket with pickles. Try the broccoli salad too. Once you can force yourself to choose they take your meat off the heat and chuck it into a little polystyrene tray with your choice of salad and pickles and usher you on past the sides bar, by which time you are allowed to pay and finally sit down. The older male sibling couldn’t look past the lump of brisket on the grill infront of his eyes. I made a swift re-allocation of choice to chicken wings and a sharing negotiations commenced. Slaw, burnt end beans, pickled red onions and cucumber, broccoli salad. A dark beer for him and a ‘hard’ cider for me. Please note if you are not American, there is nothing noticeably ‘hard’ about this cider but it is a refreshing brew nonetheless. I’m not going to break out my flowery adjective reserve here. It was bloody excellent and that is all. Brisket was tender and succulent in big beefy slices,exactly as brisket should be: bloody excellent. The chicken wings were crisp and both types of hot and (I think) Asian in style served with spring onion trimmings and the kind of mega-spice-mouth-freeze that I’ve only ever experienced with szechuan pepper previously: bloody excellent. Proper coleslaw, beany beans, lovely crunchy broccoli in a salad arrangement with bacon, almonds and some buttermilky dressing goodness now on my list to try and recreate at home. The food at Mighty Quinns is Bloody Excellent. So it isn’t a romantic, sensual experience in luxury dining (though you would get this girl there on any date night). There are no poetic menu descriptions, no raw vegan clean eater options, no artistic smears of reduced puree jus on your plate. Hell there aren’t even plates, but there is good, honest and incredibly tasty food and big bottles of house sauce on your clunky wooden table. The toilets are ridiculously huge with nice green tiles. It’s pretty good value, has a bustling, social atmosphere and serves better pickled cucumber than I do. You have no idea of the physical pain I feel admitting that, and if anyone else said first it they would have got a fork in the eye. 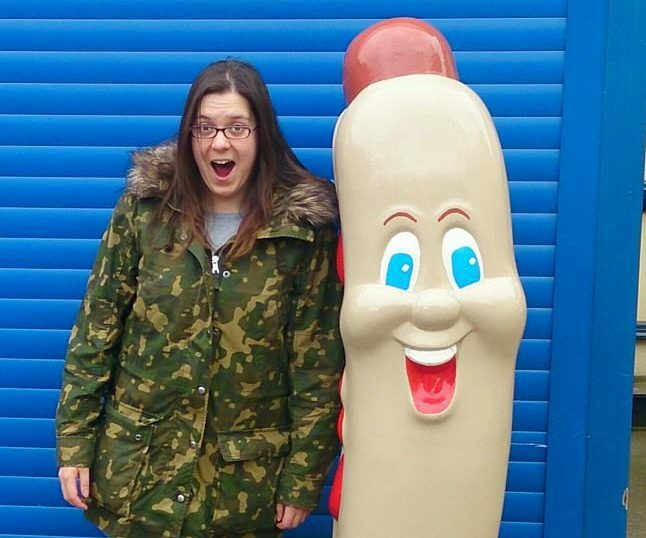 Thank you Mighty Quinns, for you are mighty indeed and I hope to one day find your equal on these shores. Or just come back to see you again. Bloody excellent.